The intersection of 42nd Street and Broadway in Manhattan marks the epicentre of New York’s theatre district – customarily referred to as “Broadway”. There are 8 theatres on 42nd Street and any self-respecting blockbuster musical wants to or needs to, get an opening there if it’s going to succeed big-time. Thus when Michael Stewart and Mark Bramble (book), Harry Warren (music) and Al Dubin (lyrics) penned their “Broadway-based” musical in the early eighties, “42 Street” sat easily as their preferred title. 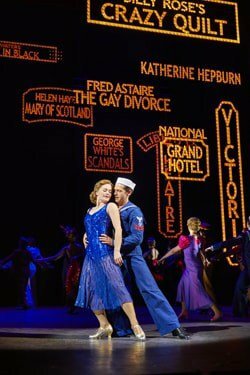 The show 42nd Street is Broadway writ large: huge company, a multitude of colourful costumes, songs (some great), small-town girl makes good and, yes, above all, those mesmerising “dancing feet”. If your thing is being engulfed by a forty-plus chorus-line as it bashes out its spectacular tap-athon then this is undoubtedly the show for you. If it’s not your thing then I would suggest it is still the show for you because we don’t get to see this kind of dance extravaganza very often these days – mainly because no-one can afford it. The word is that this production cost £8 million to stage and you certainly come away believing that no expense has been spared. Those costumes, those settings – some painted, some 3D – that excellent band, the half a million spent on lighting, that crystal clear sound, those two amazing set-pieces – one where we see multiple cast members peering out through their lit-up make-up mirrors and the similarly staged compartments on a train. This is all grist to the magical musical theatre mill and the vibrant images will be seared into the minds of the audience for years to come. Co-writer Mark Bramble directs this production relying heavily on the choreography of original director, the late Gower Champion (via Randy Skinner). No-one can quibble at the quality and vibrancy of the dance routines but there is perhaps a thought that Bramble should have taken account of the great strides musical theatre has taken over the last decade and have updated the direction accordingly. The book, which is the most basic you can get – chorus girl takes over from star who is incapacitated – is rather dated now and the spoken word scenes are merely a device to link together the big set-piece dance numbers and as such are rather pedestrian. The producers may find, therefore, that the modern savvy musical theatre audience demands more for its sixty-odd quid. The performer who suffers most from this unimaginative direction is Sheena Easton in the central role of Dorothy Brock. Ms Easton is a magnificent songstress and we have all long admired her clarity and feeling down the years. But she is a concert hall singer – this is her first appearance in a major musical on the West End stage. So rather than playing to her strengths – i.e. standing still in a single spot and letting her vocal talent speak for itself, she appears to have been told that she has to adapt into a “musical theatre singer” and therefore needs to change her style. It’s a style, unfortunately, that does not work. I was lucky enough to see this show in rehearsal when Easton did just stand there and sing – to great effect. Now the transition to stage and audience seems to have completely muddied her thinking and the clarity has gone – never more evident than in the jarring overuse of vibrato in her rendition of “I Only Have Eyes For You”. Great song, great singer, misjudged interpretation. Clare Halse is outstanding as Peggy Sawyer, the chorus girl up from the sticks who shoots to stardom. She’s a confident singer but can also act – something that’s not a strong point in Easton’s repertoire. Halse is given solid support by the other characters around her but the real stars of the show are those irrepressible hoofers: and the giant over-stage mirror that gives the audience a birds-eye view of the Busby Berkeley-style geometric patterns created by spreadeagled terpsichoreans is a masterstroke. There is no doubt that everyone leaves the theatre wanting to waltz their way down Drury Lane and for that, despite its faults, we can be thankful for this evocative revival of 42 Street’s ultimate Broadway experience. Broadway’s Biggest Show featuring the iconic songs 42nd Street, We’re In The Money, Lullaby of Broadway, Shuffle Off To Buffalo, Dames, I Only Have Eyes For You. 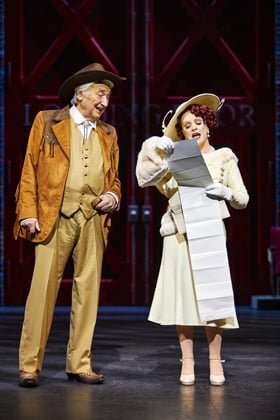 42nd STREET arrives on the West End’s biggest stage, Theatre Royal Drury Lane, Spring 2017. I don’t agree with this review at all. This review just sounds a bit dated in its approach and a bit bitter to be honest. This is a sit back and enjoy show-it’s not a serious story or serious musical-it bubbles with fun and is spectacular. I think you’ve missed another star. Stage and Screen have always had a symbiotic relationship in the musical theatre though the usual transition is from theatre to film. 42nd Street is one of the exceptions to this norm having started life as a movie as long ago as 1933 as a post “Jazz Singer” talkie. I saw the original London stage version in 1980, a Broadway production a few years later and the excellent Chichester Theatre one in 2011. The current production at the Theatre Royal Drury Lane is for me the best of the four. As the reviewer says no expense has been spared and it shows. The dance numbers are truly spectacular and the dancers are wonderful. gave it to us pretty straight. The complexities of staging a musical of this ambition are enormous. Chichester handled his by contracting it quite a lot – that worked fine. Here the reverse applies and this is a true spectacular – as the reviewer describes well. I thought Sheena Easton excellent. 42nd Street is not really a “star vehicle” and whilst Dorothy Brock is a strong part we are not in “Gypsy” or “Funny Girl” territory. Ms Easton avoided being a Diva – if anything she slightly underplayed the strength of the character. I liked this. 42nd Street is a genuine ensemble piece throughout and certainly not a showcase for any one performer’s vocal talents, however good. I greatly enjoyed Clare Halse’s Peggy. She sings and acts well and dances to the manor born. Perfect casting and appropriately this could be the making of this young actress as a genuine star. In short 42nd Street is a triumph. The actors know that they are part of a tissue-thin tale where to celebrate show business in all its glitzy, camp frivolity is the only goal. The style of acting is never reverential but never mocking either. The cast seemed to enjoy the show as much as the audience did. Which was a lot!